December 8, 2018: PAX Unplugged! PAX Unplugged is only two years old, but it has quickly become one of the larger shows that we attend each year. 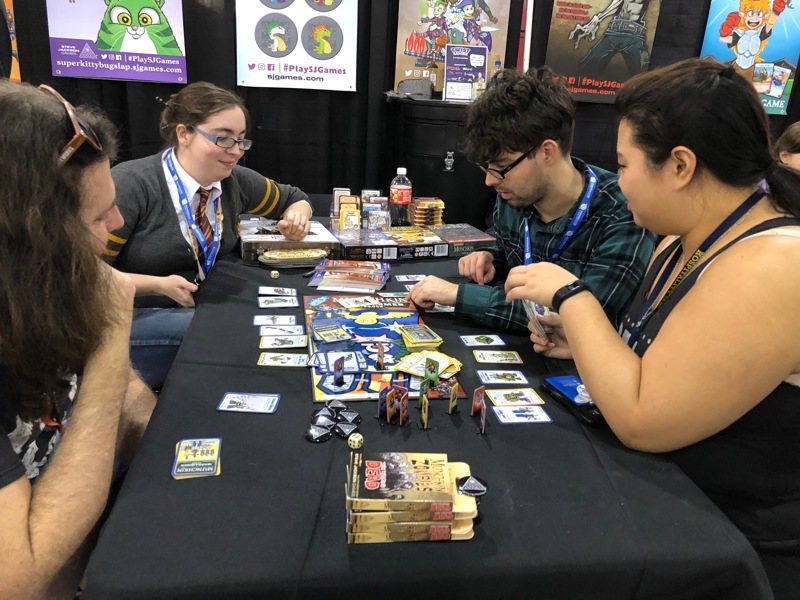 This year, Randy, Jimmie, Julie, Alex, and Annie – a brand new member of the MIB demo team – were on hand to demo the latest in Munchkin technology – Warhammer 40,000, Starfinder, and Steampunk: Girl Genius. We also ooh-ed and aah-ed over the new edition of Illuminati, played a lot of Simon's Cat, Super Kitty Bug Slap, and Blob Lobber, and celebrated the release of the Grave Danger expansion for the Munchkin Collectible Card Game with promos and booster packs. Thanks to everyone who stopped by, played a game, or talked to us about our games. There was much excitement and anticipation for the upcoming release of The Fantasy Trip and the new edition of Car Wars in 2019. The PAX convention staff are some of the best in the business, and they have made both attendees and exhibitors welcome to their show. And there was no going hungry, with the Reading Terminal Market next door for a huge variety of food and drink vendors. Here's hoping that we will see a bunch of you again next year!